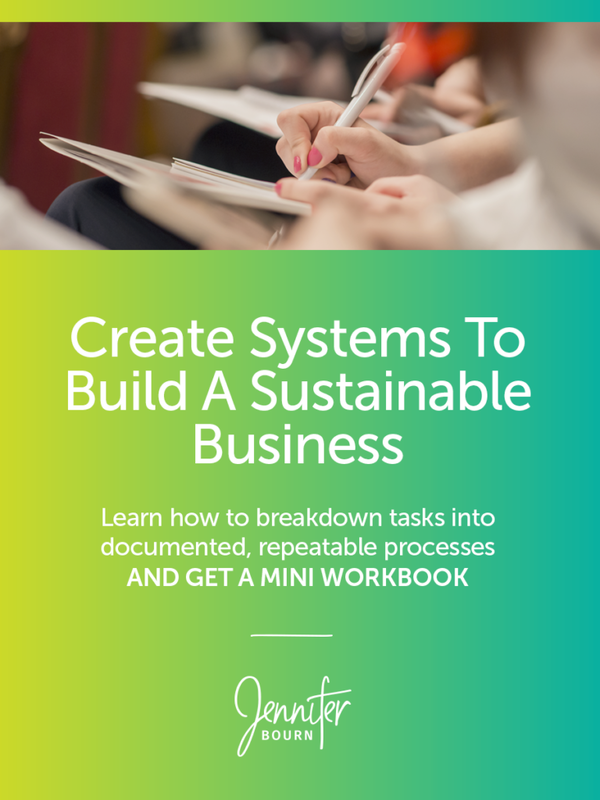 Learn how systems build sustainable businesses through the breakdown of tasks into documented, repeatable, step-by-step processes. I love systems. Systems and processes allow you to create consistent experiences for you, your team, your vendors, and your clients — and when you have consistency, you are able to track effectiveness, efficiency, profitability, and quality. In a recent post, I shared how I came to discover that systems are where I thrive. Systems are the basis for my love of design, content organization and structure, teaching, and even cooking. When presented with something complex, I can quickly see a simple system and break down the complex into a sequential process. While my personal systems aren’t always documented, I have created them throughout the years for everything from getting out of the house on time with babies and how the kids get dressed, to making breakfast and preparing meals, getting ready for bed, packing for trips, and meal prepping. For my design agency, my processes are documented and the systems are automated, and as I build jenniferbourn.com, I’m slowly planning, creating, and implementing new systems to ensure that I continue to enjoy the same freedom I do today. What I want you to understand is that there is a direct correlation between the systems you set up in your business and the amount of freedom you have to do things you love outside of work like traveling, going for hikes, crafting, cooking, playing games, building Legos, playing music, coloring, and going to concerts. Here’s the thing: I didn’t start with systems in place. When I started my business, I had no systems at all. I did everything manually, one-off, and flew by the seat of my pants — and that’s okay. That’s what you need to do in the beginning. You need to say yes to everything, work with everyone, gain experience, and learn what you like and don’t like to do and who you like and don’t like to work with. I built my agency to well over six figures with absolutely no systems in place. But running a business with no systems is unsustainable. You can’t maintain that approach forever or you’ll end up a slave to your business and go from dreaming of freedom and fun to working far more hours than you ever did at a traditional job for less money. Without business systems in place, you’ll eventually find yourself burned out, overwhelmed, and exhausted. Over time you’ll gain experience, and with experience comes a narrowing of focus in what you do and who you serve. This allows you to begin saying to no more often so you can focus on becoming an expert in a niche and creating systems to support you and your clients. Those that refuse to narrow their focus will remain on the feast or famine rollercoaster and struggle to continue spinning plates, putting out fires, and serving their clients well. Why? Because without narrowing your focus, you can’t create effective, efficient systems. Systems build sustainable businesses by solving consistent issues through the breakdown of tasks into documented, repeatable, step-by-step processes. Setting up systems in your business allows you to improve productivity, reduce stress, overcome hurdles, gain leverage, free up time, and focus on what you to do best — grow your business. With smart systems in place, you can step away from the minutia of day-to-day operations to focus on revenue-generating, forward-moving work. Business systems can be created for any repetitive task or action in your business. The key is getting the systems out of your head and onto paper. Without proper documentation, you rely on memory to get things done, which is how things begin to fall through the cracks — especially when you are busy and your business is growing rapidly. A business system doesn’t have to be big and complicated with lots of steps. The idea is that it is a documented, repeatable way of doing something that can be delegated or automated. The first step in creating business systems is identifying the potential opportunities. Look for areas of known friction. Areas where you are already encountering stress or problems are areas ripe for immediate improvement. Document everything you do. Write down everything you do each day for an extended period of time. Items and tasks you repeat often are opportunities to create a system. Own your weaknesses. Make note of things you’re currently doing that you don’t enjoy or are outside your core competency. Next, you need to understand that not all systems are created equal. Some systems will be easy and fast to create and implement and some will take a lot of energy, resources, and time. Some systems will immediately drive up profits and some are long-term investments that will produce results far in the future. Some systems will reduce stress and some will save time. Prioritize potential systems by the impact on your business. What is the impact each potential business system will have on criteria like revenue generation, time saving, stress elimination, and effort or resources. Time savings is the highest priority criteria for me because with more time I can do more and create more systems. Revenue generation is the second highest priority because with more time and more money, I can pretty much do anything that needs to get done. Once you have a prioritized list of potential systems to implement in your business, it’s time to create a system. After the new system has been implemented in your business, you need to test it and look for areas of improvement. Evaluate the system over time, noting any problems that arise, areas of friction, or any questions that others ask. Update and refine the system to eliminate problems, curb concerns, reduce friction, and answer questions. With your first system created, implemented, and running smoothly in your business, the next step is repeating the process again with another system. Review your prioritized list of potential business systems. Select one with maximum potential and create the new system. Test the system in your business over time and refine it to work out any kinks. Without systems, you’re flying by the seat of your pants, reacting to whatever comes your way, and crossing your fingers nothing falls through the cracks. You’re hoping every client has a consistent, extraordinary experience and often praying that you can get everything done on time without your head exploding. You feel overwhelm, stress, and exhaustion, you have frustration because you’re always working and never have time for the fun things you want to do, and you have guilt over neglecting your loved ones. With systems, you’re supported by a strong business foundation, you’re proactive and ahead of things, and you’re confident that everything is under control. You know that every client has a consistent, extraordinary experience and you have a plan to get everything done on time with ease. You’re relaxed and satisfied with your business, your clients, and your projects, you’re happy to have time for hobbies you enjoy, and you find fulfillment and joy in the time you spend with your loved ones. Systems make a huge difference in life and in business. Before I had systems set up in my business, I was working 16-18 hour days, seven days a week. And while I was working from home, I still rarely spent quality time with my family and two small children. My business was growing, I was making a lot of money, my clients were happy, and from the outside everything looked incredible… But on the inside, I was slowly falling apart and reaching burnout fast. Systems saved me and my business. Creating and implementing systems completely transformed my life. Finally, instead of my business running me, I was running my business. Systems allowed me to automate repetitive tasks, delegate non-essential work, better care for my clients, and make more money without working more hours. Saved me so much time per project that I was able to completely stop working weekends. That single client onboarding system made such a big impact on my business that I created a system for every phase of the website design process. My website projects eventually had automated systems to handle every phase of work, including sales calls, contracts, welcoming clients, onboarding, design, development, launch, and follow up. I called the entire system my Profitable Project Plan. The client management system reduced my administrative time on projects by 50%, which created better margins, drastically increased profits, and created more freedom to enjoy life. After that, I was sold. I created systems for the brand development process, lead generation, pricing projects, gathering testimonials, managing referrals, and even creating new systems. In 2017, systems like Profitable Project Plan allowed me to spend one-third of the year traveling and adventuring with my family, which is a big switch from working 16-18 hour days 7 days a week. And now I’m excited to be sharing the entire system with you. Profitable Project Plan is a business training course and done-for-you client management system for designers and developers. That means you’ll receive step-by-step training on managing a custom website build from sales call to post-launch follow up and a collection of pre-written emails, call frameworks, done-for-you educational client guides, and more that you can customize for your own brand and business. What’s awesome is that you can use the entire system or just pick and choose the elements that fit your unique system best without recreating the wheel from scratch! As you can see, I’m a big believer in systems and the effect they can have on your business and your life… and I hope now, you are as well!